Parks' 3 Tots Aromatherapy Gift Sets are the perfect choice for friends, colleagues, relations, or even a well-earned gift for yourself. Each contains 3 of our 'tot' size hand-crafted aromatherapy candles in an assortment of exotic and soothing fragrances. Each can be used on its own, but aromatherapists tell us they are most effective in combination. That's why we organise the packs the way we do. Each candle burns for approximately 8 hours. 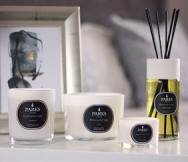 The Parks 3 Tot Mixed Fragrance Gift Set 2 contains 3 of our best-loved fragrances. Each is poured by hand into a tiny glass votive style mini vase, with one of our premium smokeless wicks at its core. Each candle is an individual work of art, hand crafted from a combination of the best 100% natural waxes available to provide a clean-burning, soot-free flame which imparts no extra fragrance or heaviness to the air. To that premium wax, our team of expert candle makers add only the purest, 100% natural and responsibly harvested aromatics, essential oils and other fragrances. The result is 3 lovely little candles with distinct, powerful fragrances that will spread through the home, offering beautiful scents and aromatherapy benefits. The 3 Tot Mixed Fragrance Gift Set 2 comes in a presentation-quality gift box, so no further wrapping is required to make a delightful gift.